I went to my friend Kristin’s baby shower on Saturday. The party was held in a beautiful room at the Dyker Beach Golf Club. The tables were dressed immaculately with white china and blue cloth napkins, a centerpiece of blue hydrangeas, and at every place setting there was a favor: a Ball jar, wrapped with baby blue ribbon tied in a bow, and filled with Hershey kisses. “Cravings” is a word you hear a lot when it comes to pregnancy. I’ve heard of some women craving foods like fried pickles and ice cream, sometimes together, and others crave simple things. Shortly before my arrival, my mother craved cherries—lucky for her, I was a summer baby, and cherries were in peak season just before I was born. But, as many of us know, you don’t have to be pregnant to crave a particular food prepared a certain way from a specific place. If you’re craving a burger from Shake Shack, a frozen veggie burger prepared at home in a frying pan is not going to deliver the goods. A craving has to be satisfied; an unfulfilled craving might drive you mad. On Friday I found myself with a strange craving for a simple yet incredibly comforting sandwich: peanut butter with bananas and honey. Lord knows what brought that on, but I had to have it, and I had to have it my way. The few times I’ve ordered the sandwich in a diner, I have found the application of peanut butter to be too heavy, the presence of banana too light, and the consistency of the sandwich leaning on soggy. When you crave a food, wait ever so patiently to acquire it, and the anticipation of finally eating this food is so tremendous you might burst, the disappointment of not getting what you expected can ruin your day. So, it was up to me to get my sandwich, a sandwich I thought about repeatedly Friday and Saturday, and then finally prepared Sunday morning: two slices of fresh whole wheat bread from the local bakery, warmed in the oven until just crisp, and topped with a gentle, thin spread of creamy peanut butter, followed by a sliced ripe banana and a drizzle of honey. It took all of six minutes to prepare, and it made my day. This entry was posted in Musings and tagged bananas, bread, breakfast, cravings, honey, peanut butter, protein, recipes, sandwiches, vegetarian, whole wheat. Bookmark the permalink. I love this post, Jenny! 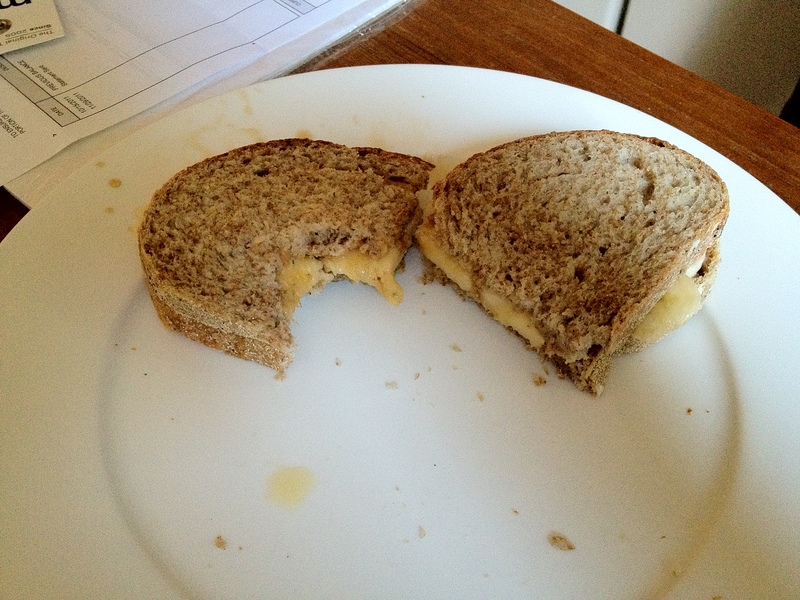 I run into this situation (often) when I have a hankering for grilled cheese, MY way. It’s so important you get the damn sandwich you want! I have never tried the combo you’re describing, thing. Intrigued.. Thanks, dear! I know exactly how you feel about grilled cheese. You can’t get it delivered, because it’s always soggy, and the cheese gets rubbery, too. It has to be fresh, and made just so.